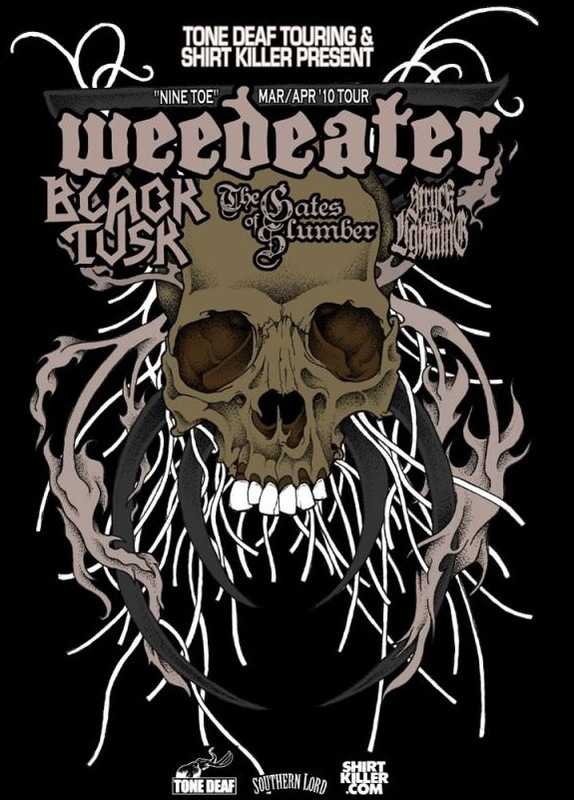 Saturday night's Weedeater show at the Studio @ Webster Hall was one of those oddly exalted affairs that was as surreal as it was vaulting, filled with rousing sounds and even better vibes. For those of you who haven't had the pleasure of visiting Webster Hall, it's essentially one of NYC's oldest—and most run-down—multi-leveled dance clubs. So while we dirtbags were reveling in the fuzzed-out glory of a lineup that also included Struck by Lightning, The Gates of Slumber and Black Tusk, the main hall upstairs was filled with Twilight moms taking in Blue October's performance. Odder still, there was also an '80s prom-themed dance party underway in yet another room. Needless to say, this made for some interesting people-watching while waiting on line for the bathroom. Back in our dungeon-like surroundings, Ohio's Struck by Lightning kicked things off with a concise set of terse, arty metal. Up next were the doomy Gates of Slumber, who had the crowd head nodding en masse in response to their sludgy, churning riffs. 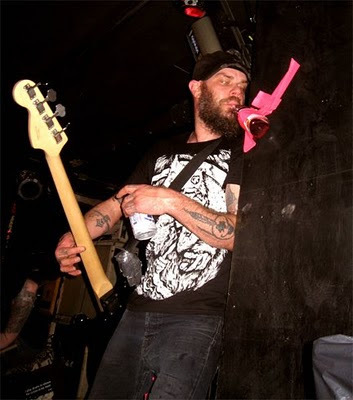 But it was really Savannah's Black Tusk [pictured above] who impressed that night, bringing a ton of energy and possessing the same kind of appealing uptempo, groove-laden style Kylesa is known for. 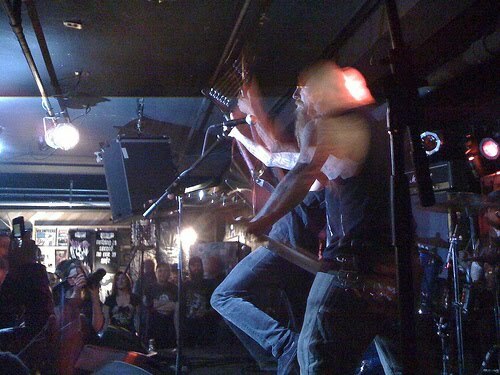 Definitely check out their forthcoming Relapse debut, Taste the Sin, when it's released on May 25. 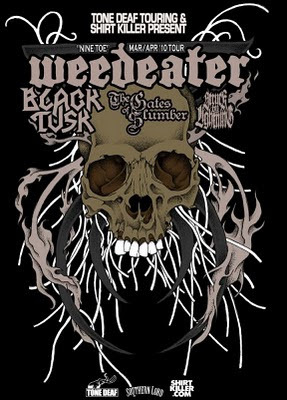 Finally, it was Weedeater's time to unleash their patented brand of "weed metal," and needless to say, they did not disappoint. Maniacal leader Dixie Dave took liberal sips of 'Tussin from a bottle that was taped to a wall adjacent to the stage in between churning out hits like "Good Luck and God Speed" and "Wizard Fight" before the packed room. Even party goers from the other events became transfixed by the hypnotic primal sounds coming from the stage. Wonder what they'd all think if they knew the significance of the "Nine Toe" tour's name. Fueled by healthy helpings of Southern sludge and cheap PBRs, the Brooklyn Vegan affair was one to remember and probably one my favorite shows (so far) of 2010. Thanks to Liz Ciaverella-Brenner and Earsplit PR for the photo of Dixie Dave. I don't get Black Tusk. But I also don't get (or like) Kylesa. "Thunder," what a perfect description. Thanks for checking in, Susan.